I have have been trying to learn how to warp two threads with a single cross. My current project is shadow weave and alternates two colors. The yarn is a sticky wool, though, and I am worried about beaming (15 yards for throws 48” wide) with possible twisting of the two warp threads if they are together in the cross. Can you describe the steps for doing this? 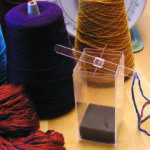 It’s a good idea to practice this with two different-colored threads so that you can track the position of the two threads as they form the cross on the pegs. If you are a front-to-back warper, you’ll probably start winding the warp at the top left peg. If you are a back-to-front warper, you’ll probably start winding the warp at the last peg the warp will use, either at the bottom right or bottom left of the warping board. The start positions for front to back and back to front are shown above. The instructions given here are for front-to-back winding, but all hand positions are the same for back to front (just starting at the bottom peg). For either method of warping a loom, start with the light thread above your index finger, the dark thread below. Start (see Photo a below) with the light thread on top of your index finger (the dark thread below) and your hand facing toward you. Place the threads in this position on Peg 1 (b). Turn your hand counterclockwise so the black thread moves to the top and place on Peg 2 (c). Take the two threads (keeping your finger between them around the edge peg at the right (d) and then down the warping board for the number of yards you are threading to the end peg and back up to the right edge peg as usual (not shown). Turn your hand counterclockwise at the right edge peg (e) so the black thread is on top and place over Peg 2 (f). Turn your hand clockwise and place over peg 1 (g), bring both strands down to go around the starting peg in a clockwise direction (h), and turn your hand clockwise to come back to the starting position (i). P.S. Note that this is just one of several ways to wind two threads together. Another is to reverse the hand positions, starting at the top peg with your index finger pointing toward the wall instead of away from it. Posted June 22, 2016. Updated September 4, 2017. If you have a weaving question please email Madelyn! 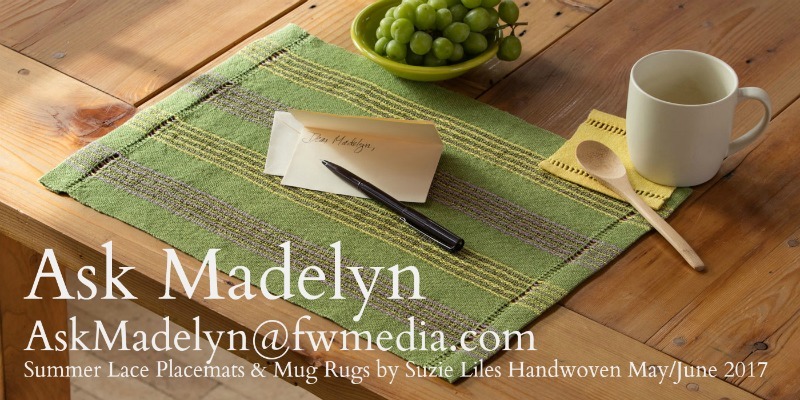 Featured Image: Summer Lace Placemats and Mug Rugs by Suzie Liles Handwoven May/June 2017. View related & recent “Ask Madelyn” posts!